The colors on this Leeward Motel sign are phenomenal--robin's egg blue and yellow, so mid-century. 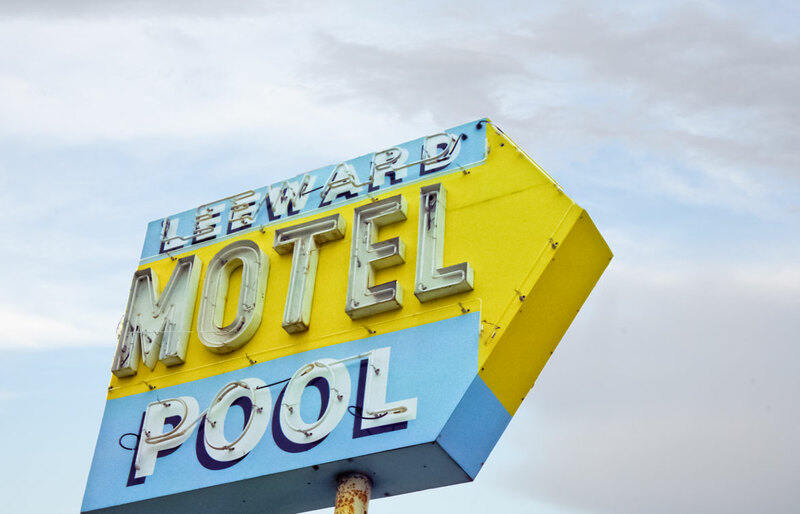 The motel sign (vintage motel signs framed prints) is a dying breed. Few motel signs of the mid-century remain. When a photographer spots one, he/she snaps away. The motel sign has become somewhat of a tourist attraction in the United States. Check out Santa Monica Blvd in West Hollywood and you'll see one motel sign after another on the median strip. The walls of buildings and infrastructure throughout the world turned into the canvases for youth and impacted the world’s populace with shocking messages--a graffiti gift to passersby. In the 60s The New York Times reported the trend of some young people tagging the subway walls and cars with their names. Soon, everyone wanted a piece of the action and graffiti became widespread. Most markings were scrawl, but some were a gift of art. The gift came in the form of a man with talent in his hand. Artist Keith Herring brought this art form to a Golden Age by his artistic renditions on unused advertisement panels throughout New York City. Other artists followed suit and to this day, if you look hard, you can find graffiti that was Herring-inspired—bright contrasting colors with bold, clear shapes. Considered a demon to some and art to others, this signage was a statement from artists who felt they had right to make public art for art’s sake and gang members who expressed their aggression on walls with text and image in a declaration of turf. While the art world gave Herring wild accolades for his work, cities worldwide struggled to control tagging, or posting graffiti in conspicuous public places. Herring, meanwhile had his work codified his work onto toys, books, games and other home accessories in Europe and the U.S. In the Far East, artists worked to little notice on impressive murals that appeared throughout Asia by the end of the century.